Episode 1 Greek. Cerberus is a three-headed dog who guards the gates of Hades in Greek mythology. If you use the card "Firewall!" you can change the results to affect Ultimates instead of Megas. Youkomon + Win Ratio 60% With the demon dog's orders, hellfire surges forth from the Dark Area! 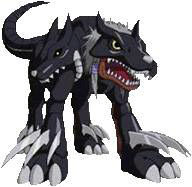 Has the power of "flame"
Attack increases by 200 against Virus Digimon.